Sewan Grass (सेवण घास) is the primary grass of extremely arid parts of Jaisalmer, Barmer and Bikaner districts of western Rajasthan in the Indian Thar desert. Sewan grass is a perennial grass that can live up to 20 years. It is a bushy, multi-branched desert grass with ascending to erect wiry stems, up to a height of 1-1.6 m, and a stout woody rhizome. Leaves are alternate with a thin leaf-blade. It thrives well under moisture stress on sandy plains, low dunes and hummocks of this region, receiving annual rainfall below 200 mm. Sewan grass is native to dry areas of North Africa, Sudanese and Sahelian regions, East Africa, and Asia. It is found in dry open plains, rocky ground and gravelly soils. About 80% of the total geographical area of Jaisalmer covering Nachana, West Puggal, Mohangarh, Sultana and Binjewala with 100-150 mm annual rainfall supported Sewan grasslands. 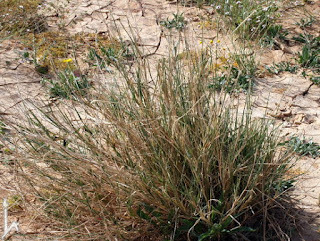 Species like sewan grass are very important in arid environments because they provide forage, which maintains both wild mammals and livestock, and soil cover. Scientists in October 2014 at Rajasthan University of Veterinary and Animal Sciences (RAJUVAS), Bikaner have achieved a breakthrough that could open doors for technology driven, soil-less cultivation of seedlings in the state. The scientists have claimed success in developing seedlings of Sewan, a desert grass found in western Rajasthan, using the hydroponics technology. Quiz in RAS Exan. 'सेवण' घास किस ज़िले में विस्तृत रूप से उगती है?